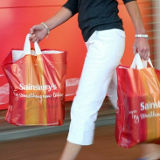 Free grocery delivery and promotional codes for use with food, drink, electrical and household purchases at Sainsbury’s. Discounted delivery from £1 and free delivery on your weekly shop order over £100. Earn Nectar™ points with every order for members of the scheme. Weekly savings on selected grocery products of up to 30% and order & collect available if you can’t be in to receive your grocery order. Monday to Thursday after 2pm. Sainsbury’s is one of the UK’s top supermarkets with a huge range of brand and own brand groceries, housewares, men’s, women’s and children’s clothing and products for the home and garden. They have stores in most towns and cities plus online at sainsburys.co.uk. Sainsbury’s is a UK wide grocery supermarket operating both online and in-store. The group also owns other well known retailers including the recently acquired Argos and furniture and home store Habitat. Today I’m concentrating on the Sainsbury’s online store. Looking over the homepage it is clear that the focus is promoting and linking to many services as well as the bread and butter grocery side. The main menu offers customer links to Grocery plus the clothing side TU, mobile, banking and the previously mentioned acquisitions. There’s a handy store locator at the top of the page along with a link to the help centre removing the need to scroll to the footer where many links normally live. The help centre includes access to frequently asked questions, online shopping, delivery and collection and payment help. The list includes many other links to help users with using the Sainsbury’s site. Most of the services available online are also well represented in-store such as the clothing ranges from TU. The clothing range has been developed to offer trend following fashion for men, women and children. Homeware and electrical is also a strong selling point both online and in-store. For the social fan Sainsbury’s has a comprehensive social presence across all of the popular networks. Mobile apps are available to make shopping more accessible for the mobile and tablet user. There are some great delivery deals on offer for grocery shopping where you can pay a fee for discount delivery for up to 12 months at a time. Payment methods include credit/debit card, coupons and vouchers, Sainsbury’s gift card and cash (in-store only).